New Supplies in the Studio----PLAYTIME! I received a shipment of new and exciting goodies last week. After a crazy weekend...HS play, 2 soccer games, yard duties, etc....I finally got down to playing in the studio. This is a picture I took on my "Oh So Smart" phone. Tiny but better than I could get today. 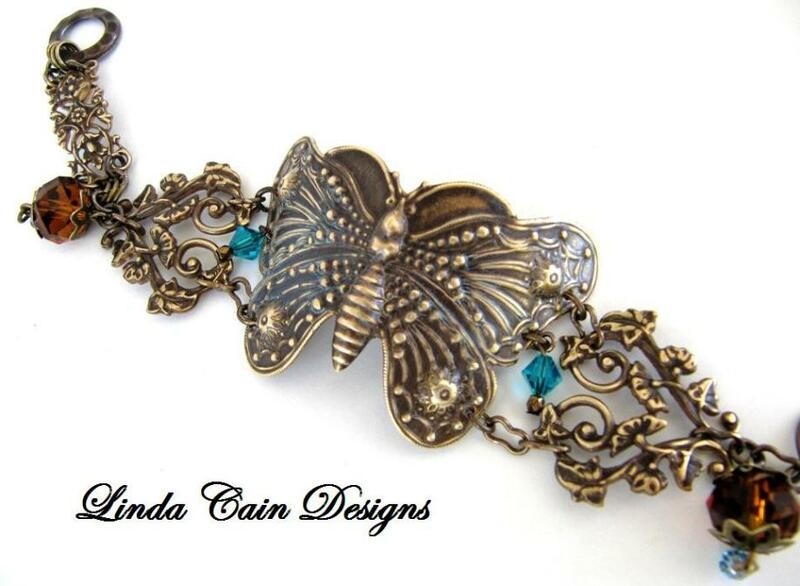 It's using the new and wonderfully creative Patina's from Vintaj and Ranger. I painted them on with a brush...we'll talk later on that. Then I opened the Spray Inks from Dylusion and Dylan Reaveley. Oh My Gosh....the COLORS are AMAZING!!!! Trying to watch Tim's video class Creative Chemistry 101 and play at the same time. I sprayed several colors, dried, and sprayed again with a Crafter's Workshop/Julie Balzer Stencil. In my box of goodies I got my set of Remnants Stamps from Tim. The Old by Fav, Fancy Flourish, stamp and Black Archival Inks added the swirls. Here's another shot of the 2nd layer with stamps and Archival Ink. This is over another Julie Balzer Stencil and more black ink...LOVE the contrast. So, that is just the beginning. If you want to follow along, go make a page with just color all over it. 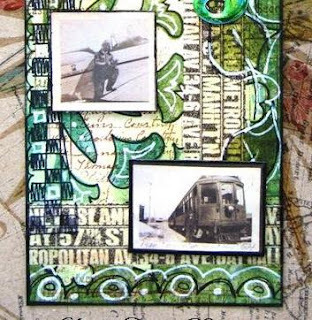 Add some stencils with sprays or Distress Inks and Applicator, and then give a favorite stamped image a spot in 3 places. Overlap off the page for composition and we'll be back later. I'll be back later with some more steps to add to this page. Remember this bracelet I made last summer? Well I had to try the new Patinas on it. There's terrific step-by-step instructions from Jess at Vintaj here. Look at the dramatic difference now! It REALLY shows off the turquoise and amber beads. I used Cinnabar, Rust and Verdigris on a tiny brush. Then here's a bit of fun. The Owl was embossed using Moonlit Night Deco Embossing Folder, a Square Blank, and the Vagabond Machine. Then using a small brush again, I added several layers of color, sanded, and polished. The result is a cute little owl in a fun outdoor setting....leaves and such. I had a fun day with my new supplies and therefore had to share with you. Check out the links below to find these products. You can also find many Vintaj products at Hobby Lobby. Wow, I've finally gotten some time to watch the last 2 episodes of Creative Chemistry 101 with Tim!! And of course, he never fails to inform and teach. You cannot go wrong with these lessons, they are a mini Ranger U for sure. Click on the link above for supplies from Inspiration Emporium and start taking the classes. Now for a bit of Tag Fun from me! I think I've found my niche. This tag and my journal pages make me happy. And it's just a piece of paper....if you don't like it....wait a day and add something else. That's what happened here. I made the background. Didn't care for it. A week later it called my name! I had added color to the tag with watercolor crayons and reinker sprays. Then after using the unknown number stencil with the white paint dabber on another tag, I used Dyan Reaveley's technique of pressing the excess paint onto this tag...hence the backwards numbers here and blobby paint spots. You can also see Stencil work here. I LOVE The Crafters Workshop Stencils!!!! Julie Balzer is amazing. I actually used one of her earlier stencils, Punchinella, but it has a mini section of the Chickenwire stencil that is linked above. Tim used her Numbers Stencil in Lesson 4. Love it! If you want to see a great ARTIST at work, check out her blog. This Bird is by Collections. I sprayed it with a long ago concoction I found in a Mini Mister. Added a stamp from Artistic Outpost-Whimsical Melange and some white pen to make it stand out. The Tim Holtz Papillon stamps were stamped over the sprayed background with Jet Black Archival Ink. You can see the Butterflies and Numerals that have been highlighted with white ink. I drew a few leaves in the top left corner and painted color with the Distress Markers on them. I like my tags to lay flat. Therefore I mount them on heavy chipboard. Here I used plain old gray chipboard that I dabbed around some color with Distress Stains. Make it blotchy. and it will have a cool border. This is the button after I added layers of color with the Distress Markers. Here you can see lots and lots of doodling and pen marks. I freehand drew stars and outlined the butterflies with white pen. The white paint blob has the new Tim stamp Mixed Media over it that added a really fun layer. So if you want to practice journal backgrounds....try it on a tag to get your feet wet! It's JUST A PIECE OF PAPER!!!!!! There were so many products used here, I decided to try a different layout of them. 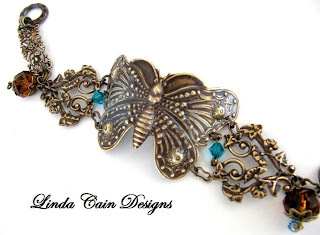 I've yet to work on setting up my inLinks, so click for Inspiration Emporium links below. Still $5 shipping within the US!! The Final Touch of Ink.....Know When to STOP! This is the end result of lots of days of playing with paint and ink. If you were here several days ago, before we left for vacation, I started this watercolor journal page. This is how it looked the other night, when I decided to STOP! If you look below, this was all white from a stencil and Snow Cap Paint Dabber. I originally used Deep Purple Archival Ink over this spot....did NOT turn out well...WAY too bright and not a good color combo. SO.....I painted over with white paint, that picked up some of the color, that was OK.
Then I added some water to Claudine's Altered Orange Studio Paint and gave it a wash.
OK, that looked better, then I added the stamping again with COFFEE Archival Ink.. YES!!!! Much better. If you don't like it, COVER IT UP! Here I added lots of doodles with pens...White, Distress and Black Gel. More ink around the letters and such. You can see where I used a Dylusions stamp on the edge and just added more of the same squares to enlarge the area of checkerboard. I LOVE these little birds that I found... too cute. Some stamping with French Ultramarine Archival over the white paint. Also added some color to the hand with a Distress Marker. So in conclusion....this is what we started with...Distress Stains. This was the middle with a few layers added. And this is the end result. Hard to believe I TONED down the color with Walnut Stain spray, but you can see it in the closeups. We had a challenge sent out to the Inspiration Emporium Design Team - use the Idea-ology Pocket Watch and make anything you want. Check them all out here. Not a problem....I have lots of stuff I've hoarded to throw at this project! I removed the back of the Pocket Watch and punched 2 holes in the base...not an easy thing to do, but I got it done. Then I strung beads on the wires and put them through the holes. The Crinkle Ribbon was dyed and tied in a bow. I have had the Collections vintage photo forever. It seemed to need some color, so I tinted it with markers. Fussy cut and edged. The Rubons are on the outside of the glass. Some lavender Rhinestones, Heart Button, and LIFE pin are glued into place. I cut out the other papers and used as background over the smallest square from Tim's Lost and Found Paper Stash Collection. It was the perfect size! The Locket Key and Philosophy Tag were added with a Large Swivel Clasp. 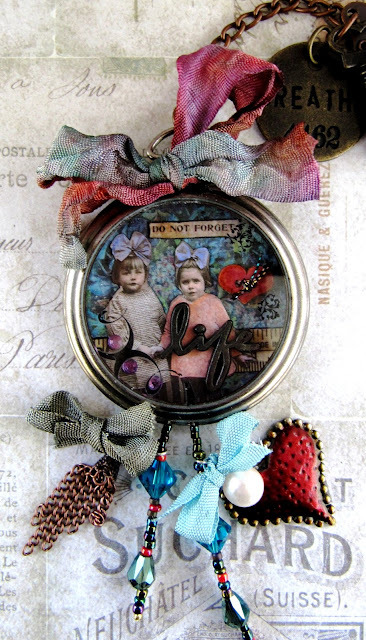 So jump on over to look at the other girls gorgeous creations, and get a Pocket Watch of your own to make into a little treasure! It's been a wonderful couple of days to relax, sit on the patio, eat seafood, read a book, journal a little and of course SHOP﻿!!! We had a very productive day at Destin Commons. Got a new purse, a vase, a shirt, and a birthday gift for a friend. Bill was so great...he finds things I'm looking for that I can't find! WHAT A GUY! So we went to a place to eat that HE would like (he's had enough seafood right now). He got his Pizza fix for the week and a beer. Then on the way back to the hotel...the Krispy Kreme "Hot Donuts" sign was ON!!! Donuts and coffee as a chaser...we're so easy. I have no idea why there are squares on the pictures here...they were taken on my so-called "Smart" phone. And I'm never happy with the way this notebook works....give me my desktop computer ANY day!!!!!! This is really a great evening on the Harbor. And this shot looked a lot better on my phone, but you get the idea. Off and running again in the morning....heading for Memphis. We'll wave at Shelly Hickox as we go by on the highway. I hate to leave the gorgeous view down here, but the strange thing is, it was 81 in Morton, IL and 78 in Destin, FL today!!! What's wrong with that picture...???? It's Not What You Look At.....It's What You SEE! I've been working on this post off and on. Putting up different stages of the pages. This may develop even further, but I thought I would share a bit of it today. It has the main layer and then stamps, stencils, and pen markings. I started by spraying water on the pages and adding several colors of Distress Stains in layers letting it slightly dry in between layers. Then I sprayed a light mist of Walnut Stain in spots to kind of dull the colors in areas. Here is where the fun begins....I wrote the saying by Thoreau on the page and added white paint dabber to stencils. Lot s of white and black ink follows. ﻿Here are stamped images from Dylusions and used Balzer Designs Templates. So today I'll sit out on the balcony and doodle some more. It's brightening up now and we'll watch the goofy kids out on the Parasail go up. A million dollar view last night on the Bay. I know Bill is enjoying the view. Last night dinner at the Marina Cafe was wonderful. The Gulf Shrimp were perfect! Have a great week and be good to each other! Go Green-A Color Challenge is the Theme for Inspiration Emporium this month. Check out the other DT members all month here!!! I used a lot of products here, some new, some not so new....ALL fun! I started with the new Tissue Tape Commute on a Large Manila Tag. I put a piece across the bottom and one down the side. Then I laid down The Crafters Workshop Template by Julie Balzer Designs called Daisy Doodad. Next I added all kinds of GREEN Distress Inks on the tag. Pine Needles, Forrest Moss, Bundled Sage, Peeled Paint, Shabby Shutters, and Crushed Olive. This stencil is so cool!!!!! Then I outlined it with a black pen. I added stamped images from the Dylusions set Around the Edge using Jet Black Archival Ink. 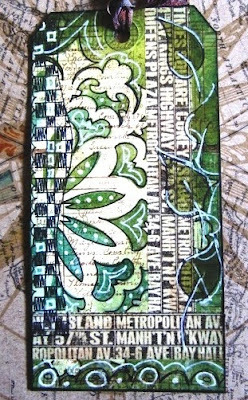 I used a script stamp from Artistic Outpost Ephemera Backgrounds and Coffee Archival Ink over the tag. These stamps are extremely fun for tags and journal pages!!! I'm just sayin'....check them out at Inspiration Emporium! The vintage photos are from Tim's new paper stash Destinations. Then I added lots and lots of white and black pen marks for kicks. This is just an old addiction of mine...doodling around everything makes me happy! The $2 Cash Key is added to the dyed Crinkle Ribbon with a Wire Pin. 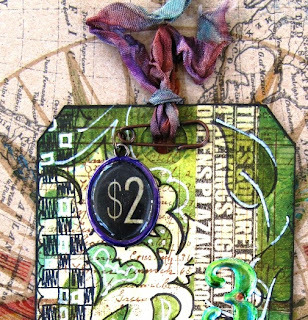 Alcohol Ink adds a little color to the Cash Key and Distress Stains and Inks to the ribbon. The Mini Numeral 3 is colored with Alcohol Inks and punched with the Drill Punch. Then lastly I want to show you the wonderful affects of the Distress Markers on Kraft Resist paper. I photographed the tag on top of the paper that I had played around on with the markers. But I thought you'd like to see the whole sheet. This is just the middle of the paper...the possibilities are endless!!! Very fun, and the resist is so cool with the markers....easy to do. I also used the green markers on the tag in spots...like on the leaves. And one more thing, have you checked out Tim's new CREATIVE CHEMISTRY 101?? I'm all signed up and ready to go! There's a video to introduce you to it here. Have a great weekend....we're going to I'm sure. More and more layers on watercolor paper. I found this saying and decided it needed to be added to my page. I had the background for several days....just needed something in the middle to state something profound....ha! Here is a corner of the page. Always ready to try something new. And usually my kids or grandkids guide me along the way. The numerous layers of color were painted, stamped, sprayed, and colored with watercolor crayons. Then I added the letters and outlined in white marker. They didn't show up very well until I added the white outlining. The 5 in the bottom is a Bingo stencil, like the BING at the top from Balzer Designs and The Crafter's Workshop. They are added with Distress Inks. The Barn Door Distress Marker over several layers of watercolor are show up differently all around the page. This is the 2 page layout in the Journal. If you look closely in the upper right hand corner in the background, you can see the upside-down 4 of the wood mounted stamp from Tim that started the whole collage. Here you can see just one stage of the layering of the page. Numbers have always been one of my favorite things to doodle. I LOVE how the Chickenwire Stencil came out with Aged Mahogany Distress Ink and a touch of Chipped Sapphire to shadow. It's freezing here today. But the sun is shining. Tax day with Anita is on my schedule for the afternoon. Just glad I live in the USA.